We turned the potential inconvenience of essential works carried out by our client into an overall positive message thanks to visually engaging design and uplifting language. 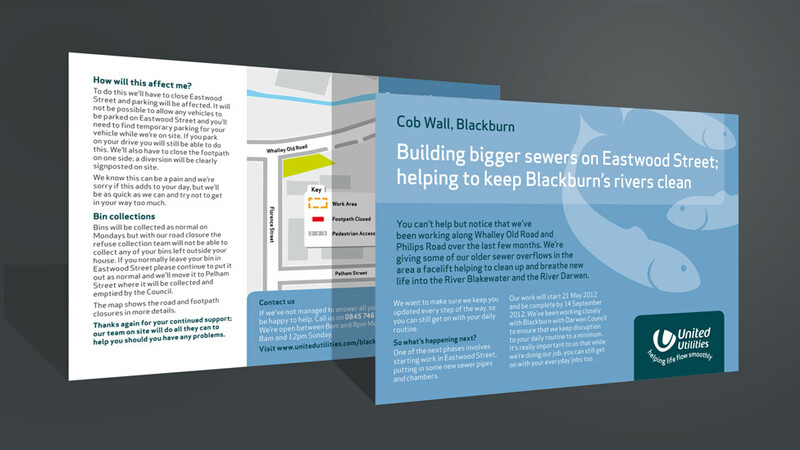 As part of their ongoing public relations and communications work to engage with their customers by sharing timely updates, United Utilities asked us to create a flyer design for Cob Wall in Blackburn, to give the public and local businesses information about ongoing works in the area. Although United Utilities adhere to strict brand guidelines, the company allows for a certain degree of creative input and suggestions. For this flyer design we incorporated a range of stylised fish graphics that would feature on the front cover, and which help illustrate the reason behind the works being carried out by United Utilities – to create cleaner rivers. The inclusion of bespoke maps and diagrams helps show how and where works carried out by United Utilities may cause disruption for traffic and business. This message is offset by the use of positive and uplifting language. The branding also contributes to an overall message of positivity, thanks to its uniqueness and visually engaging quality. Over the years we have helped United Utilities on a wide range of projects.